Usually, if I'm playing a table top game, it's a pen and paper RPG. I don't know what it is about board games, they can't typically keep my attention, but when my longtime friend Stephan Frost asked me to test a game he'd designed called BRUTALITY I knew it'd be good. Frost is a creative director at Nexon, and worked at Blizzard, Amazon, and Carbine, so we've known him for the video games he's made. He was telling me that he'd play-tested this new board game with designer friends for about a year, and that it was like playing a quick deathmatch video game but at the table. He came to visit me in Seattle where I treated him to a round of avocado toast, our city's best known dish, while we played a hand written prototype of BRUTALITY. The game is super fun, plays fast, and is easy to learn. I was immediately hooked. The game is like a crazy mix of Overwatch character ability combos, in a medieval Darkest Dungeon looking world, with random events changing the game. I wanted to keep playing to see what different characters would play like together. And these characters are dripping with personality. There's a single mom who carries a demi-God baby while wielding a huge two handed sword. There's an amputee Torturer that drags around a massive iron maiden to hit enemies. 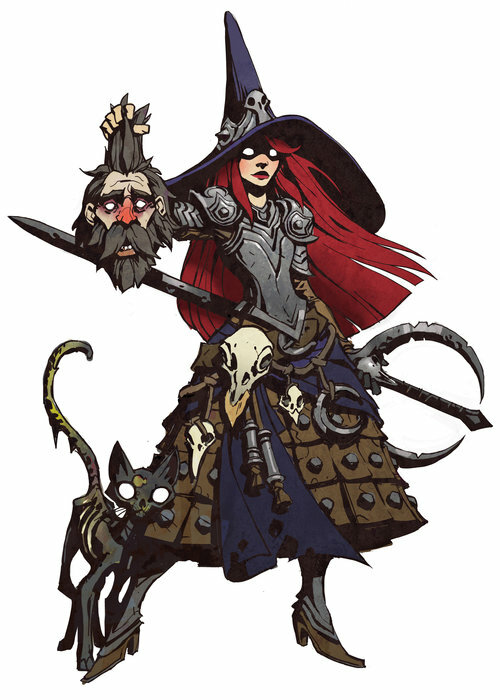 Oh and a Conjurer that summons Ghost knights and walks around with her rotting undead black cat. Not to mention the art. Did you see the art? Just look at this! And as soon as you've got the characters down you realize that the cards make the game crazy. There's a card where you leave fire behind you for a few turns, and those flames stay on the board the rest of the game. You can deflect attacks. Mind control. Slap people across the board (and through the fire). You're laughing the whole time while trying to figure out unique ways to decimate each other. It doesn't even matter if you get stomped because the way it goes down is always fun and the games only take 30 minutes or so to play, so you can come back for your revenge. I'm a fan of underdogs, and the team that put this together did it on their own. Frost orchestrated the whole thing, in his free time, while he was working a fulltime job making other games. It has a great style, fun mechanics, and it feels different than the usual Kickstarter board game. There's only a couple days left in the BRUTALITY Kickstarter. Check out this video and join in if it fits your fancy. I hope the game does well because Frost worked really hard on it and it's one of the few board games I like... also, I want that Demon King figure so bad!